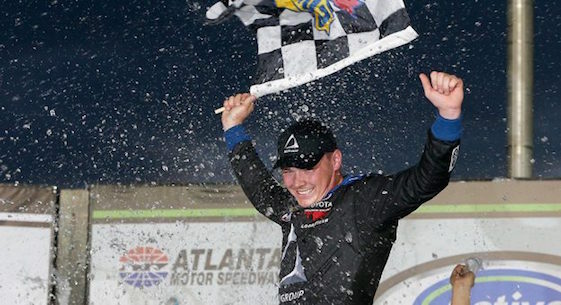 Brett Moffitt celebrates his victory in Saturday’s truck series race in Atlanta. Brett Moffitt drove the No. 16 Toyota Tundra to victory in Saturday’s Camping World Truck Series race at Atlanta Motor Speedway. Moffitt pulled away from defending series champion (and last weekend’s race winner at Daytona) Johnny Sauter on a late restart to get the win in overtime. “That’s a hell of a way to start the year right there,” Moffitt said. It was Moffitt’s second career win in the Series. It was the first victory in the series for his team, Hattori Racing. Final pit stops proved pivotal in the race. Kyle Busch had a dominant truck, but an apparent miscommunication on a late pit stop led to Busch leaving his stall before the left-rear tire was securely fastened and the tire falling off. Busch returned to his stall and got a new left-rear tire, but the mistake took him out of contention for the win. (10) Brett Moffitt, Toyota, 134. (3) Noah Gragson, Toyota, 134. (9) Johnny Sauter, Chevrolet, 134. (14) Ben Rhodes, Ford, 134. (2) Matt Crafton, Ford, 134. (7) Stewart Friesen, Chevrolet, 134. (19) Myatt Snider #, Ford, 134. (12) Jesse Little, Ford, 134. (16) Grant Enfinger, Ford, 134. (13) Austin Dillon(i), Chevrolet, 134. (17) Parker Kligerman, Chevrolet, 134. (11) Joe Nemechek, Chevrolet, 134. (6) Dalton Sargeant #, Chevrolet, 134. (20) Austin Wayne Self, Chevrolet, 134. (21) Korbin Forrister, Toyota, 134. (15) Bo LeMastus #, Toyota, 134. (18) Austin Hill, Chevrolet, 133. (22) Justin Fontaine #, Chevrolet, 133. (8) Cody Coughlin, Chevrolet, 133. (1) Kyle Busch(i), Toyota, 133. (5) Justin Haley, Chevrolet, 132. (29) Wendell Chavous, Chevrolet, 131. (25) Jordan Anderson, Toyota, 129. (27) Robby Lyons, Chevrolet, 128. (30) Jennifer Jo Cobb, Chevrolet, 120. (24) Josh Reaume, Chevrolet, Accident, 119. (31) Clay Greenfield, Chevrolet, Too Slow, 116. (28) Norm Benning, Chevrolet, Vibration, 108. (23) Akinori Ogata, Chevrolet, Accident, 62. (26) Joey Gase(i), Chevrolet, Electrical, 7. (32) Scott Stenzel, Chevrolet, Electrical, 0. Average Speed of Race Winner: 123.816 mph. Time of Race: 01 Hrs, 40 Mins, 00 Secs. Margin of Victory: 1.326 Seconds. Caution Flags: 5 for 24 laps. Lap Leaders: K. Busch(i) 0; N. Gragson 1-43; M. Crafton 44-50; J. Sauter 51-52; K. Busch(i) 53-83; J. Sauter 84-92; K. Busch(i) 93-128; M. Snider # 129-131; J. Sauter 132; B. Moffitt 133-134. Leaders Summary (Driver, Times Lead, Laps Led): K. Busch(i) 2 times for 67 laps; N. Gragson 1 time for 43 laps; J. Sauter 3 times for 12 laps; M. Crafton 1 time for 7 laps; M. Snider # 1 time for 3 laps; B. Moffitt 1 time for 2 laps.